Submitted by witness on Friday, July 11, 2014. LOCATION DETAILS: On 95th Street west of LaGrange Road in Country Lane Woods which is part of Forest Preserves of Cook County. OBSERVED: I was driving home from my shift at UPS at about 4 a.m. last night. Traveling east on 95th street, most likely before Lagrange road, but I am not certain of which main cross street I was near, because I normally don't take 95th home. I was still in a heavily wooded area. As we were driving something darted out in front of me, perhaps a block or so ahead, it ran across the street from left (north) to right. I thought it could have been a person, but it ran across the street really fast, like someone with those fancy prosthetic legs. As I approached the area, I slowed down to see if there was someone there, but no person was in sight. Like I said, it was tall, thin, and ran fast, like it only had to take a few steps to cross both lanes. I spoke with the witness in phone. • The animal was estimated at 6 feet tall. • The animal was thinly built. • The hair was solid dark in coloring. • The witness was about 200 feet from the animal when it darted across the road. • The animal was easily seen in the headlights of the vehicle. • Although the area is heavily wooded the moon was full and had not set yet. The moon set at 4:38 a.m. a little over a half hour after the sighting. The Forest Preserves of Cook County manages more than 69,000 acres of public land—about 11 percent of Cook County. The ecosystems within the Forest Preserves of Cook County consist of prairies, woodlands and wetlands. 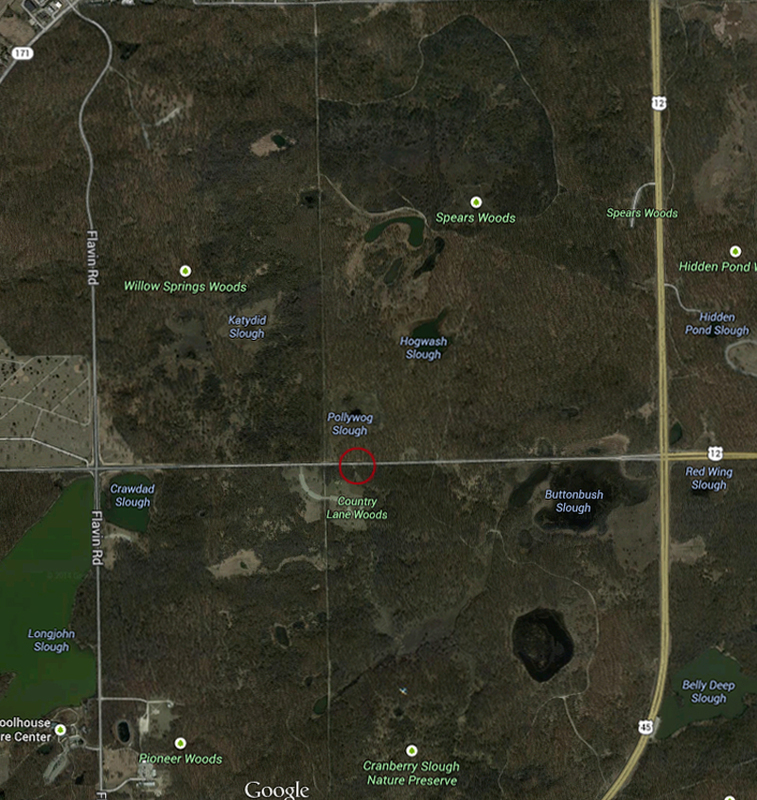 The area of the sighting location is (circled in red).